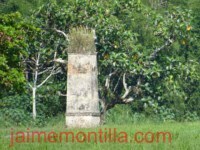 As we understand it, Hacienda Maria and this "trapiche", which is approximately 1 mile SE of Maria in the same Barrio San Lorenzo of Morovis, were part of the same property owned by the Del Rio family. It appears that because of inheritance, at one point in time they were separated, operated independently and belonged to different family members. Hacienda Maria was owned by Alonso del Rio and used to house a small distillery where Ron del Rio was produced. The chimney below is the only remain of the this trapiche which we were told belonged to José (Pepe) del Rio. 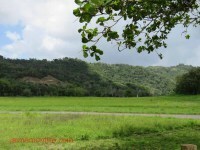 On the PR Trapiches Project page , there is reference to Barahona sugar factory in Morovis. In 1908, an ordinance was passed by the Executice Council of PR during the time Regis H. Post was Governor granting Carlos de Ereño, his heirs, successors and assigns, the right to take and use four (4) liters of water per second from the Quebrada del Medio, in the Barrio Barahona of Morovis for industrial purposes in connection to his sugar mill. We do not think this smoke stack belonged to the Barahona sugar mill as Barrio Barahona is about two miles north of Barrio San Lorenzo.